China is not messing around with its strict rules about mobile phone use on planes. Three passengers have been arrested and jailed in three separate incidents in Beijing between since the start of the year, the Civil Aviation Administration of China (CAAC) said, according to a China.org report. 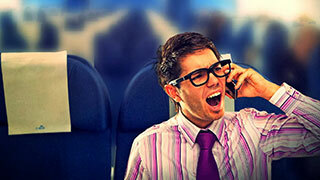 The CAAC last year brought in stricter rules governing various in-flight behaviour including the use of voice calls. It is not just voice calls that are outlawed in China but all use of mobile phones while in the air. The country’s aviation authority is virtually on its own among major air regulators in that it doesn't consider the 'airplane mode' function on phones to be completely safe during flights. According to reports the three pax were jailed for between three and five days.